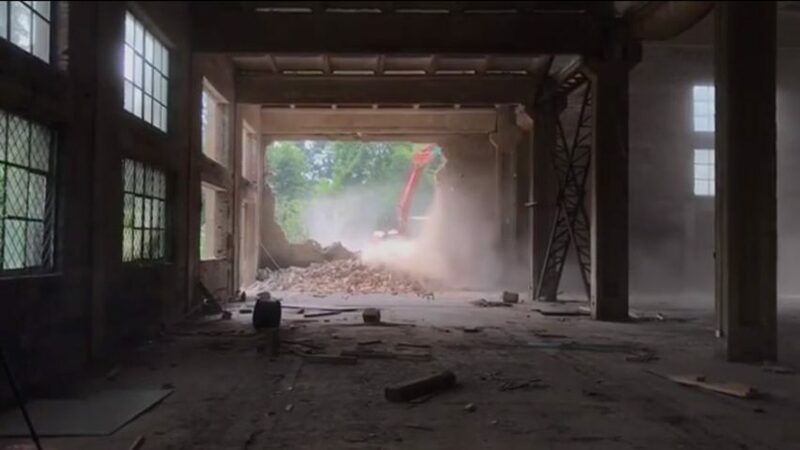 Artist and activist Ai Weiwei took to Instagram to show Chinese authorities knocking down his studio in Beijing, with many of his artworks still inside. Ai, who worked with Herzog and de Meuron to design the Bird's Nest stadium in Beijing for the 2008 Olympic Games, posted a series of clips showing construction machinery being used to tear down the brick walls of his studio. Clouds of dust can be seen billowing towards the camera as people look on and film with their smartphones. The artist, who has been outspoken in his criticism of the Chinese government and has been living in Berlin since 2015, bid "farewell" to the studio he had occupied since 2006. In one caption he said that he and his team had been given "no precaution" as to when the destruction of the "East German style socialist building" would begin. An assistant of the artist named Gang Ra told news agency AFP that the rental contract on the building expired last year. Ai's staff had been told to vacate the property within days, but were not informed when the demolition process would start. A large number of works by the artist were still in the building and could not be moved before demolition began. My Beijing studio since 2006. Ai became outspoken in his criticism of China's government after 5,000 school children were crushed to death in the 2008 Sichuan earthquake when their badly constructed classrooms collapsed. In January of 2011 demolition workers flattened Ai's Shanghai studio in a single day without warning. He was arrested in April of that year, imprisoned for 81 days, and had his passport confiscated. As soon as his documentation was returned he fled to Germany, where he has been living in exile and making art about Europe's refugee crisis. In videos documenting the fourth day of the demolition process his assistants can be seen sweeping up dust from the rubble and carefully dusting down a sculpture. Ai has previously used dust in his works of art. In his 2008 piece Dust to Dust he exhibited 30 jars filled with crushed up ancient Chinese pottery as commentary on the cultural destruction of the country's building boom. In a panel discussion with Herzog and de Meuron in 2016 the artist, who also collaborated with the architects to design that year's Serpentine Pavilion, said that architecture was regarded by the Chinese authorities as a "dangerous threat". Last year the dissident artist protested President Donald Trump's border-control wall with three security fence-style installations across New York City, including a giant bird cage that sat in Central Park before being taken to this year's Venice Architecture Biennale. Main image from Ai Weiwei's Instagram account.